Decorative deciduous tree native to eastern China, and a member of the Pine family, Pinaceae. The trees normally acheive a height of around 70ft., but can reach 150ft in height with a trunk girth of 8ft. Shape is pyramidal. 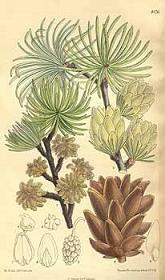 The leaves of Pseudolarix are longer and broader than Larix and are arranged in spirals. The trees bear cones shaped rather like an artichoke, which fall apart and shed seeds. It is a popular variety for bonsai and is prized for its golden fall color. The trees thrive in deep rich loamy soil with an acidic pH between 5 and 6 and prefer a humid climate in full sun. They do not tolerate heavy clays or alkaline soils well. Propagation is performed mainly by sowing seeds in fall or spring in sandy loam free from lime. Stored seed should be cold stratified for 20 days prior to planting for best germination. 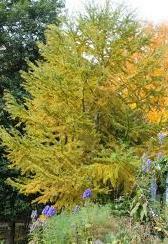 Pseudolarix amabilis is considered as one of the 50 main herbs in Chinese medicine. The bark is a strong antifungal and is used to treat ringworm. Hardy to -20F (-28.9C) Height: 150ft Spread: 50ft.